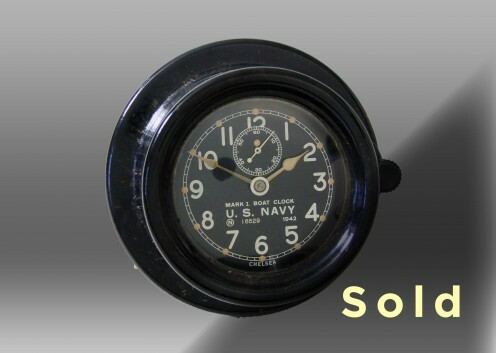 This unique timepiece, a 3.5” Marine Mechanical Mark I Boat Clock, was made for the United States Navy Department and shipped from our factory on April 15, 1944. It features the original black phenolic case, hinged bezel and a black 12-hour dial with while Arabic numerals and a second hand bit. The 12E movement (time-only mechanism) has been completely overhauled, the case has been cleaned, and the bezel glass has been replaced.